The Lexmark IBM Wheelwriter II typewriter has been a solid powerhouse machine providing the best in features and reliability for decades of service. The Wheelwriter 2 personal typewriter from IBM provides the user with entry level features and functions that is desired in any easy to use typewriter. The Wheelwriter II typewriter includes a spellcheck option, which is an upgrade from the Wheelwriter I. Each reconditioned typewriter is thoroughly inspected, all necessary parts replaced, lubricated, tested, and includes a full 3 month warranty. 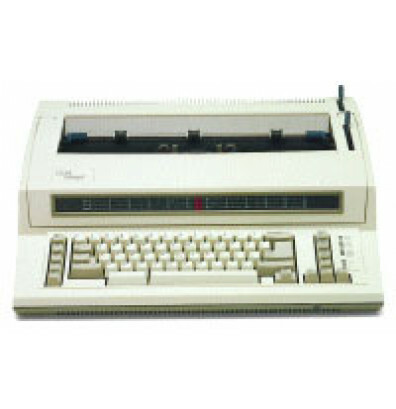 Lexmark IBM Wheelwriter II typewriter also includes a printwheel, ribbon, lift off tape, and a newly installed battery. I TRIED TO DO MY RESEARCH ON BUYING A REFUBISHED TYPEWRITER. THERE ARE TIMES WHEN YOU STILL NEED AN OLD FASHION TYPEWRITER. ORDER ONE PURPOSELY SIMULAR TO THE IBM THAT WE ALREADY HAD. THE ONE WE RECEIVED IS VERY CLEAN, TYPES SMOOTHLY. I AM VERY HAPPY WITH OUR PURCHASE. WHEN I ORDERED, I WAS A LITTLE WORRIED. IT DID TAKE A LITTLE WHILE BEFORE WE RECEIVED IT. BUT ROME WAS NOT BUILT IN A DAY. Great value, great price, great Company. Thank you!!! Got our refurbished typewriter in and am very impressed...works like a new one! Thank you for your prompt delivery and great product. In the legal profession we still need typewriters so thank you for rehabilitation of old ones! The reconditioned typewriter has been working very well. We have not used the second one yet. It is a reserve. I'll be honest: I haven't had a lot of opportunities to use this typewriter. But everyone else in the office seems to think it's working great. We've previously ordered a Wheelwriter II from DigitalBuyer.com, and based on that experience we decided to buy another one. That's a testament to the quality that DigitalBuyer.com offers. In the future, if our office needs another typewriter, we'll definitely choose DigitalBuyer.com.